I had a long flight scheduled with John today. 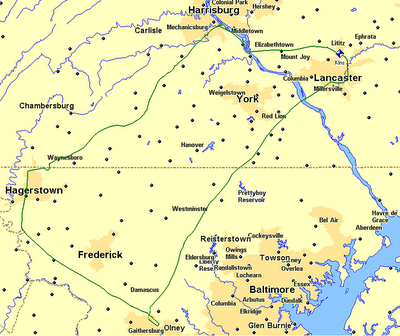 We were going to fly to Allentown, Pennsylvania, about 125 nautical miles north. Our plan was to leave between 3:30 and 4:00, fly up there, have dinner at the airport restaurant, then leave after civil twilight to fly back. The entire trip would have counted as more cross-country time, and the flight back would have satisfied a requirement for a dual cross-country flight at night of more than 100 nautical miles. The morning was foggy, and fog became haze, and although it was a lot better at 3:00, the reports were that visibility was only 4-5 miles along our intended route of flight. So we scrapped the flight. Oh, well, I think Rich and I are going to do the night cross-country this week, so I'll keep making progress. I spent an hour with Rich today flying under the hood. For anyone who might not know what the "hood" is, it's a device that restricts a pilot's visibility to the instrument panel so they can't see what's outside. Learning to trust what the gauges are saying is hard -- my inner ear and other senses had a tendency to tell me I was leaning toward the right, so I kept wanting to bank to the left. It's hard, and takes a lot of concentration. On the map below, not how crooked and wavy the early part of my route is. Rich had me go under the hood as soon as we took off from KGAI, and then dictated an instrument (VOR) approach to Carroll County (KDMW), a missed approach, a VOR approach to Clearview (2W2), a missed approach, and then an ILS approach to Frederick (KFDK), and then a missed approach. By that time, I was worn out from concentrating on the instruments, and I elected to take the hood off for the return to Gaithersburg. I was glad I did, too, in part because the sunset was gorgeous! But also because I was tired of concentrating so hard, and it made me happy to realize how relaxing simply flying has become compared to the early days of learning. I'm not really looking forward to the instrument rating I know I need to have. It's the day after Thanksgiving. Jodie had to fly back to Maryland last night, and I'm sticking around in Knoxville to help with part of the Birdwell Family Leaf Rake on Saturday. 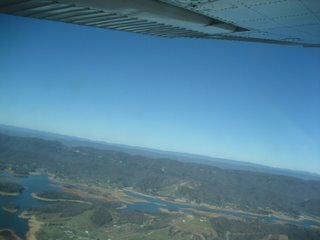 So I called the flight school at the Knoxville Downtown Island Airport (KDKX) and scheduled an hour of dual instruction. I'm not looking for instruction that will move me toward my license. But I'm going to fly into Knoxville at some point in the (near?) future, and I wanted to fly around the area with someone who knows the area. I navigated by pilotage, picking up and following the Holsten (sp?) 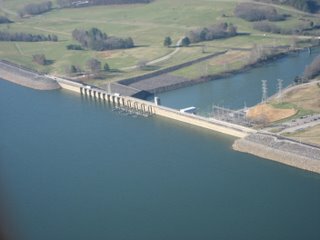 River up to the dam where the water leaves Cherokee Lake. It's cool, 'cause this is where we all waterski in the summers. Then we flew up and circled around the Birdwells' lake house. 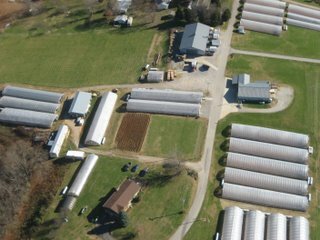 I got a few pictures of the house, but couldn't get a good angle, so I think the picture of the tomato farm up the street is my favorite. 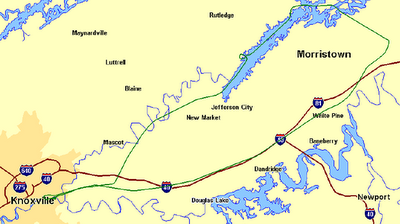 headed East, and picked up I-81 South toward Knoxville and the airport. 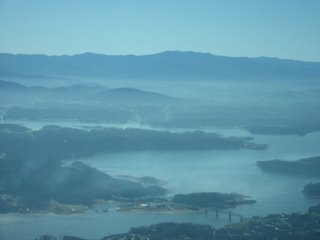 Along the way, though, we had beautiful (albeit hazy) views of Douglas Lake, the Smokies, and Mount LeConte. I landed on runway 8 at KDKX after a high and fast approach, but with a nice flare and touchdown. On approach to runway 8, there is a hill of land that made me inclined to stay a little high. Then, when I got past it and dumped full flaps, I still landed 800 feet down the runway. The approach to 26, on the other hand, is low and over the water. I like to think that would have made a difference, as I wouldn't have been shying away from the treetops, but in truth it may be that I just need some pattern work. 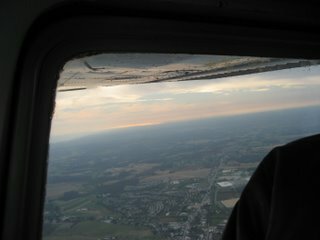 All in all, this was a great flight, and I learned a lot about flying in the area from talking to Brandon. I'm confident I won't have any problem getting into Knoxville when I finally fly there, and really can't wait! Jodie and I went to Knoxville Tuesday night for Thanksgiving. I had to do some work on Wednesday, so I holed up in a Starbucks with my laptop. I finished my work a couple hours before I needed to meet Jodie and her family for dinner, so I figured I'd explore the local small airports. 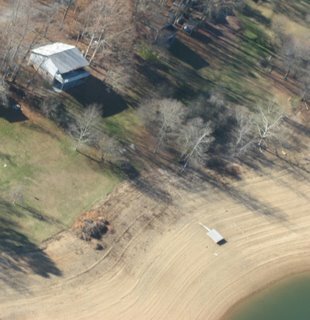 I had read about the Sky Ranch (TN98), a club-owned airfield carved out of the Class C airspace around Knoxville's McGhee-Tyson Airport. With a little driving around, I found it tucked away on an island in the Tennessee River, downriver from the Knoxville Downtown Island Airport (KDKX). Pulling into Sky Ranch, I was impressed with the number of aircraft and hangars. I saw a bunch of old taildraggers, an RV, an AgCat, a few Bonanzas, and a lot of Cessna 150s and 172s. A cottage-like structure with a front porch, deck, and chairs overlooking the river was on one side of the grass runway. As I parked next to what I later learned was the clubhouse, a Cessna 152 landed. I walked down to chat with the pilot as he secured the plane, and learned that Sky Ranch has been a club since the 70s. It costs $250 to join, and $30 a month. They sell gas for $3.03 a gallon to their members, more than a dollar less than I pay in Maryland. The club owns three planes, and the monthly $30 gives you tie-down rights. That is a DEAL. I walked back to the car, and as I did a man pulled up in a truck. Figuring I'd get some additional information, I introduced myself. His name was Lee, and after repeating some of the basics I had already heard about Sky Ranch, he asked me what I was doing right then. I told him I had to be home for dinner, and he said, "Well, do you want to go flying? Right now." I immediately recognized this as one of those pilot-community things that only happens every so often, so I said yes and grabbed my headset out of the car. "What kind of plane?" I asked, and he said, "Well, you're about to find out." We walked over to the covered tie-downs and right up to N84021, a 1946 Aeronca 7AC Champ. I've read about taildraggers, and I've read about grass runways, but this was my first experience of the way flying used to be. I helped him do the pre-flight inspection and pull the plane out, then I sat in the back seat and held the brakes while he spun the propeller to start the engine. We taxied (bounced) out to the end of the runway, he pushed the throttle forward, and we started accelerating down the runway. It's commonly said that you have to fly an airplane from the time you undo the tiedowns until you re-tie them. When we had accelerated some, Lee pushed forward on the stick and the tail came up off the ground. For the first time, I understood-- although the main wheels were still firmly on the ground, Lee was flying the plane. Shortly after we lifted off, Lee gave me the stick. There were no gauges in the back seat, but I could see the slip-skid indicator over Lee's right shoulder if I craned my neck. It took a LOT more rudder to keep the Champ coordinated than it does in the 172 I regularly fly. We climbed to 3500 feet and flew north to Norris Dam. We flew around the dam, then Lee took the stick, chopped the power, and pointed the nose at the ground in a steeply banked, circling dive. We dropped 1500 feet FAST, and for the first time ever I felt a little queasy. Lee leveled out and told me he wanted to practice a few s-turns over I-70. After one or two, he let me try, and I did a bunch. There was a 15-knot wind blowing across the road, so the conditions were perfect. Lee said he could tell I was a student because I did much better than almost all pilots he goes up with, not really changing altitude -- which was amazing to me because I couldn't see the altimeter. We flew back to Sky Ranch after I flew low over Jodie's parents house, and Lee dropped the plane down onto the runway in a beautiful forward slip, stopping in well under 1,000 feet. As we were taxiing to the fuel pump, I asked Lee about radio calls. He said, "What radios?" For the first time I realized that although there was an intercom, there were no radios in the plane. Taildragger, grass runway, no radio, no transponder, hand-propping.... This is what flying used to be. What a treat! Although I had the GPS turned on, it was only there for safety's sake, and we didn't use it at all. 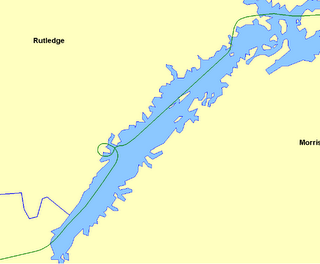 Instead we mostly used pilotage and ded (dead) reckoning, with some VOR navigation thrown in. It was hazy, but there were a couple really pretty moments. Although my photo didn't come out well, the early morning sun was lighting up Baltimore's Inner Harbor in bright, neon-like orange. When we left Lancaster, we were instructed by air traffic to follow the western bank of the Susquehanna River, up past Harrisburg International Airport and the big nuclear power plant on -- drum roll -- Three Mile Island. The river was pretty, and it was fun to follow the curves of the river. Later, after we climbed out of Capitol City, there was a layer of scattered clouds right at the altitude we were planning to use. We decided to climb above it. We did, and ten minutes later realized we had made a mistake. It was beautiful, because the air was clear, but what had been scattered clouds seemed to knit together under us to become one solid overcast layer. When we finally found a hazy opening where we could see the ground, we took it, telling the bewildered controller that yes, although we had just requested a higher altitude, now we wanted a lower one. The opening wasn't very large, but with some steep s-turns we made it down through without breaking any rules. 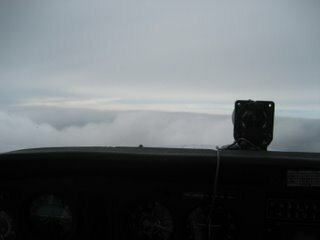 Above the clouds, of course, you can't see the ground to navigate by pilotage, and for some reason we weren't receiving the Hagerstown VOR signal. We were only a few miles north of Camp David, and didn't want to break into the restricted airspace. 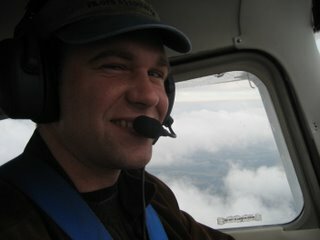 If we hadn't found that break in the clouds and been able to get below them, I would have broken the "rules" of the flight and used the GPS. Total flight time for the trip was 3.1 hours, which means that I got my required cross-country training all in one flight. Probably one more dual cross-country, then my solo cross-countries. Making progress.....! 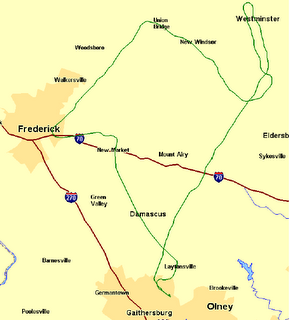 I flew up to Frederick today. Instead of just landing and taking off, I decided to park and wander around the airport a bit. There wasn't much to see, so why did I do it? Just because I wanted to have the experience of flying TO somewhere, to get byond the feeling of the flying being the end goal. It was cool, though I would like to go back and look for the restaurant that's supposed to be good. So I took off and headed east over to the practice area. It was a bit hazy below, but not bad, and the sky was very blue. I had decided that I wanted to work on my transitions into and out of slow flight, the goal being not to lose any altitude. So I did it again and again and again, and I actually wasn't that bad at it. I was able to go from 110 mph to 60 mph and stay within 50 feet of my original altitude. Then I worked on steep turns. I didn't have any problem losing altitude in the turn, but I did gain some altitude coming out of a couple of the turns. Still, up to the point where I turned out to straight and level, I was completing the 360 within 25 feet or so of my original altitude. Not bad. All in all, it was a good, fun flight. I'm hopeful that I can maybe get some cross country time soon, though, because I don't want to keep doing the same thing.